Melon soup with assorted melon "confetti"
Slice melons of your choice in half and scoop out the seeds, then scoop or cut the fruit out of its rind and place it in a food processor or blender. 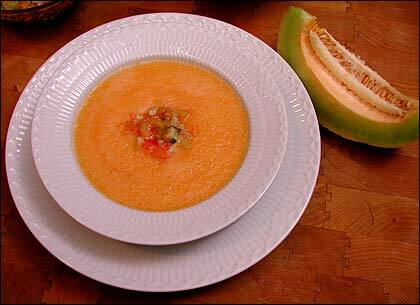 Add the orange juice and lime juice, and puree until smooth. Finely mince pieces of assorted melons to create a colorful "confetti" and sprinkle it over each bowl of soup as a tasty garnish. 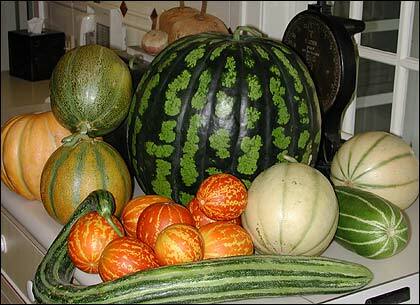 For more information about melons and all their many refreshing varieties, see Melons for the Passionate Grower, by Amy Goldman (2002).